He returned to Canada with a visceral perception of the blues and a deep knowledge of blues history. After making the stories his own, he earned the right to tell them. Rotundo has developed his own language of the blues, honing the technique that gives the voice power and authenticity. In 1997, Rotundo led a band called The Blue Canadians (with Peter Schmidt, Shane Scott, Julian Fauth and Doc MacLean) who played the Toronto circuit. In 2000, he was asked to join the legendary Jack de Keyzer Band, while continuing to tour internationally with the Blue Canadians. He was thrilled by the opportunity to play with “one of the best Canadian guitarists”. Aside from de Keyzer, Rotundo has performed with Lee Oskar (orignal composer of the hits including “Lowrider”, “Spill the Wine” and “Slippin Into Darkness”), Ronnie Hawkins, ex- Muddy Waters drummer Willie “Big Eyes” Smith, Madagascar Slim, Mel Brown, Jeff Healey, Johnny Winter, Edgar Winter, Finis Tasby, James Cotton, Magic Slim and The Tear Drops, Elvis Costello, Shakura S’Aida, members of Downchild, among many others. Rotundo’s 2001 debut album “Blowin’ for Broke” featured twelve original songs written by David and produced by bassist and engineer Shane Scott of Stone Pillar Productions. 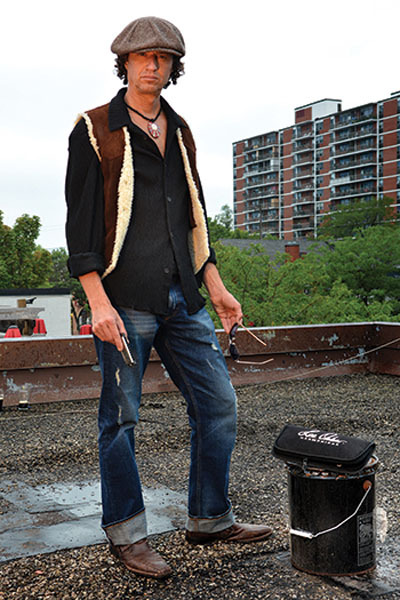 The album was nominated “Blues Album of 2001” by the Canadian Independent Artist Association and was winner of the MapleBlues Award “Best New Artist of The Year 2002”. In 2003, David returned to Stone Pillar Studios with his newly formed international “David Rotundo Band”, resulting in the highly popular, critically acclaimed “Blues Ignited” album featuring international guitarist Enrico Crivellaro. Rotundo, as well as writing the material for this album, also co-produced it with bassist/engineer Scott. After much fan demand, in late 2007, David recorded and released his live album – “Live at Roc ‘N Doc’s” which captured the true essence of the band’s high energy live performance. In 2008 it was considered in the top twenty blues albums released that year by various community radio stations with the blues format shows. When you see David Rotundo live, you’ll know instantly that he lives for what he does.